One of the rooms that we spend a lot of time in, but don’t think much about, is the bathroom. How would your day be different if you started out in a spacious, smart, relaxing bathroom that reflected your personal style as opposed to the small, outdated bathroom with insufficient storage, that you have now? 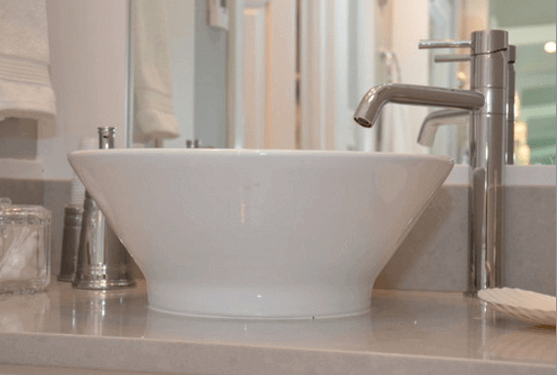 Wallace Baker, Owner, Award-Winning Trendmark, Inc. offers 5 Tips for the best bathroom lighting. Trendmark, Inc continues to excel in award-winning kitchen, bathroom, home and outside renovations in Raleigh, Cary, Chapel Hill, Durham and Apex North Carolina. Toilets are by far the main source of water use in the home, accounting for nearly 30 percent of an average home’s indoor water consumption. Older, inefficient toilets are a major source of wasted water in many homes. Replacing these toilets with WaterSense labeled toilets (products that meet the Environmental Protection Agency’s criteria for water efficient usage) could save nearly 11 gallons per toilet in your home every day!